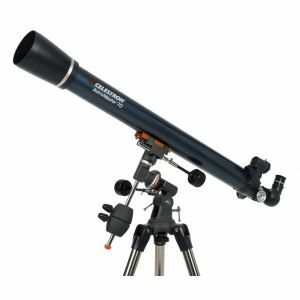 Eyepieces – The 15 mm and 6 mm eyepieces can be used in any telescope with a 1.25” focuser. Each eyepiece is fully coated to improve light transmission and protect the optics. 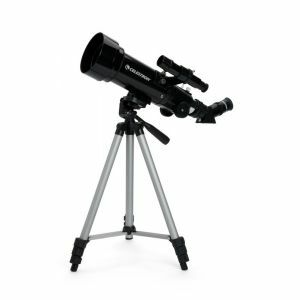 The 15 mm Kellner eyepiece offers a nice medium magnification view in most telescopes, and the 6 mm Plossl provides high magnifications, great for the Moon and planets, especially when seeing conditions are good. 2x Barlow Lens – Insert the 2x Barlow Lens between the eyepiece and the telescope and it doubles the magnification of any 1.25” eyepiece. That means the 15 mm Kellner included in this kit will double in power, effectively becoming a 7.5 mm eyepiece, and the 6 mm will provide the magnification of a 3 mm. Any other 1.25” eyepieces you already have will also work in this versatile accessory, giving you even more magnification choices. Remember, high magnifications do not always produce clear, sharp results, especially on evenings of poor or moderate seeing conditions. 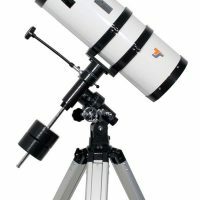 Experiment to find the magnifications that are best for you and your telescope. T-threads are machined into this Barlow lens, allowing a user to attach a DSLR camera with the addition of an optional T-ring. 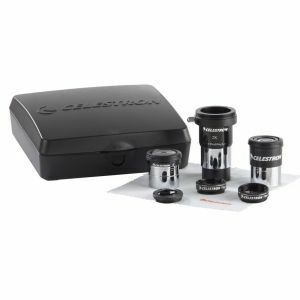 This economical eight-piece eyepiece and filter accessory kit enhances the performance of your Celestron AstroMaster, or most any other telescope. Includes two 1.25” eyepieces, a 2X Barlow lens, three filters, a cleaning cloth, and a case!